In less than two weeks, Jim Bob and Michelle will celebrate their 30th wedding anniversary. 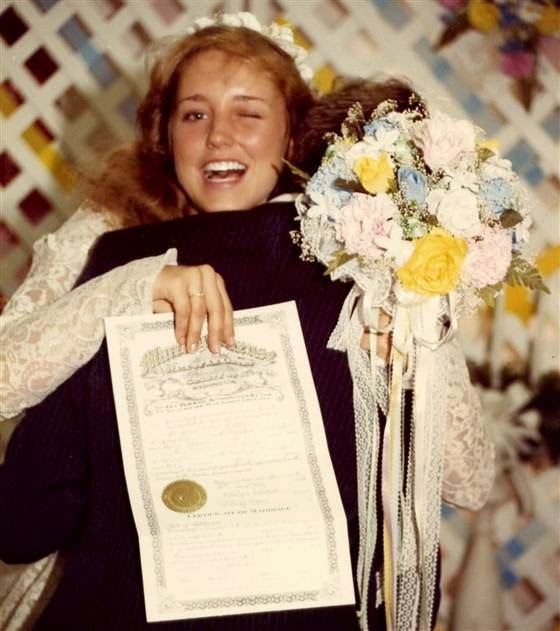 In her latest Parentables post, the mom of 19 reminisces about her "sweet and simple" 1984 wedding. The ceremony was officiated by the Duggars' pastor and took place in the hallway of the building where their church was temporarily meeting. It was a low budget wedding, as Michelle tried to come up with creative ways to cut costs so she and her husband could splurge on their honeymoon. The bride's bouquet was made of fake flowers so it could double as a decoration for the couple's new home. Jim Bob and Michelle recited their vows in front of a backdrop made of lattice woven through with crepe paper and a silk flower arrangement made by one of Michelle's sisters. Michelle wore Grandma Duggar's wedding dress, which was used as a decoration at Jill and Derick's wedding this June. Instead of pews, guests sat on folding chairs. The wedding cake was homemade by the bride and decorated by a friend. At the reception, family and friends enjoyed cake, nuts, and punch. Jim Bob and Michelle have an audio recording of their wedding, and each year on their anniversary, the couple plays it for their children. We would reenact the ceremony, show them how we walked down the aisle and tell them the stories about what it was like. It was a great moment to share with them in such a special way. 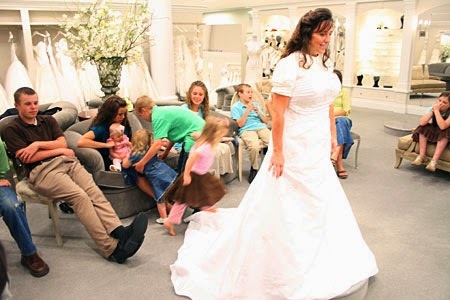 When they renewed their vows in 2009, the Duggars replicated every detail of their wedding, and all their kids (18 at the time) participated. Now that's a thrifty wedding!!! Weddings these days can cost at a minimum of $20,000 and never have the same amount of homemade detail to it, but Michelle did it on a VERY tight budget and turned it into something wonderful and homey. Good job Michelle!!! I about fell out of my chair when a friend told me hers was budget of 40K, that a down payment of a house!! Our Wedding was $900 (with the wedding dress and venue) because we wanted to cook everyone dinner. Wow! It really was a low budget wedding! I have always admired Michelle for her real thrift. This blog which is just one of many publications with this subject about Michelle in it, has made me realize it is time for me to try to imitate this good woman on this point. I doubt I will ever be blessed with a great husband similar to Jim Bob, but I enjoy being a single Christian woman and I am getting old by now. Wish you'd replay your wedding on tv ,if you did I missed it ,I really enjoy your family,you are all very interesting hope you are on many more years . Michelle puts a lot of value on memories and making memories. Yeah! It is a big family. Well I love the spirit of celebrating wedding renewal again together. It becomes a grand occasion to enjoy after thirty years of wedding. I am sure you amazingly enjoyed your past journey of married life and wishing you both have a nice time ahead too.